I have always hated “full-evening story ballets.” But Houston Ballet artistic director Stanton Welch is seeming more and more like the kind of guy who can change my mind. Operating for many years under a rule as ironclad as the Monitor or the Merrimac, I’ve become certain that the shorter the written summary of an act or scene in the program, the more I will despise it. This is fairly logical: a short summary means nothing much happens, and since the stretch ahead will last anywhere from 20 to 45 minutes, that means 20 to 45 minutes of nothing much happening. And by all means, stay out in the lobby drinking wine whenever you read that the main characters in any ballet are “entertained by lively peasants.” This will go on and on. And this is precisely how story ballets get to be “full-evening” in the first place. In all fairness, Welch is not the first or only choreographer to offer Houston Ballet audiences a gift for gripping narrative. John Cranko’s Eugene Onegin remains a theatrical tour de force whenever it’s performed here, as does the Ben Stevenson Dracula – but then again, I’ve never met a Dracula I didn’t like. Welch’s Swan Lake took an old chestnut and made it sprout into a powerful oak, giving it so much human drama that all jokes about this work being “for the birds” were silenced. And now, in his fresh setting of La Bayadere – potentially a real piece of schlock from 19th century St. Petersburg schlockmeisters Minkus and Petipa – Welch shows a lifetime’s worth of growth as showbiz impresario. It is art, it is spectacle, it is exoticism. And in the end, it is beautiful to a nearly Wagnerian degree. Tristan and Isolde, it turns out, have nothing on Solor and Nikiya in the “love death” department. In this dazzling production, with sets and costumes by Peter Farmer, Welch makes a senseless story seem to make sense. There are several interlocking loves in this plot set around an ancient Indian temple – Europeans of the late 1800s loved what came to be called “orientalism,”and this is as crazy a bit of it as you can find anywhere. Let’s see: “warrior prince” loves “temple dancer” (the “bayadere” in the title), while high priest (or Brahmin, more or less her boss in sexual harassment terms) loves her too. The warrior prince ends up with the daughter of the Rajah in love with him, and the two are pushed into an engagement. People die from this point on – starting with temple dancer Nikiya when she’s bitten by a viper placed in her basket of flower offerings. Pretty soon, everybody else is dying too, though mostly by stabbing and the collapse of the temple in an earthquake caused by some really angry gods. Welch gives us three acts of this nonsense, and convinces us to believe every minute of it. Most impressively, he resists his creative impulse and serves up the classic staging of the ballet’s sole famous scene, something called the Kingdom of the Shades. Excruciatingly slow and meltingly beautiful, this involves the ghosts of temple dancers past moving down onto the stage by way of a long ramp and then crisscrossing the entire space in a flutter of white tutus. To say that this set piece matches Welch’s own choreography perfectly is, of course, backwards. It is Welch who captures, teases and deftly prepares the way for this heartstopper, with every leap, every kick, every wave he puts in. Call it reverse engineering if you must, but the Kingdom of the Shades scene enriches everything else in this new Bayadere. And vice versa. Opening night audiences were thrilled by the company’s couple to reckon with, Sara Webb as Nikiya and Connor Walsh as Solor. Walsh brings the necessary strength and nobility to the role, not to mention some decent acting as he sinks into the drug-induced trance that carries him into the Kingdom of the Shades. Webb delivers the expressiveness and maturity we’ve been seeing in development for years, combining some dead-on dance fireworks with the style of intense storytelling that now is (I hope) forever part of Houston Ballet’s approach. Kelly Myernick, another longtime company favorite, shines as Rajah’s daughter Gamzatti, getting almost as much stage time as Nikiya and making every bit as much of it. Nicholas Leschke does his usual fine job as the Rajah, as does James Gotesky as the High Brahmin and Christopher Gray as Kalum, the animal-like, ever-slinking fakir. Jim Nowakowski isn’t onstage all that long as Agni the fire god, but he is all excitement when he is, leaping from a temple pyre over prostrate worshippers and dancing impressively before leaping right back in. 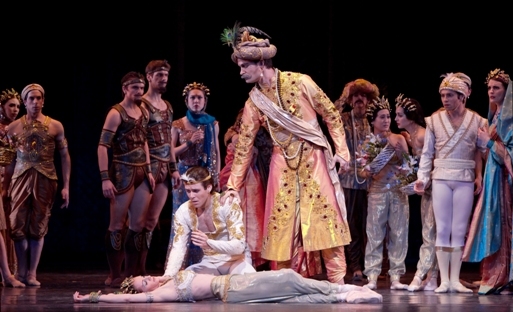 Photos by Amitava Sarkar: (above) Sara Webb, Connor Walsh and Nicholas Leschke; (below) Jim Nowakowski, in Houston Ballet’s new production of La Bayadere. You haven’t really visited a museum exhibition until you’ve strolled about the halls, stopping at paintings that intrigue one or both of you, with the show’s curator. At least that’s the conclusion I reached after touring Sargent and the Sea, its sibling Houston’s Sargents and its distant cousin, Prendergast in Italy, with Emily Neff, curator of American painting and sculpture at the Museum of Fine Arts Houston. In the case of both featured artists, the portrait master John Singer Sargent and the American-born Impressionist, Post-Impressionist or even Modernist Maurice Prendergast, there were a few things I expected but mostly things I didn’t expect. And there’s nothing quite like having the curator along to explain such things. Sargent has been a favorite of mine for decades, he having mastered the art (literally) of painting portraits of people that somehow tell their whole life story. It might not be their real life story, Neff points out, but it was the one Sargent saw in them. The one, she added with a nudge, he was paid big bucks to see. 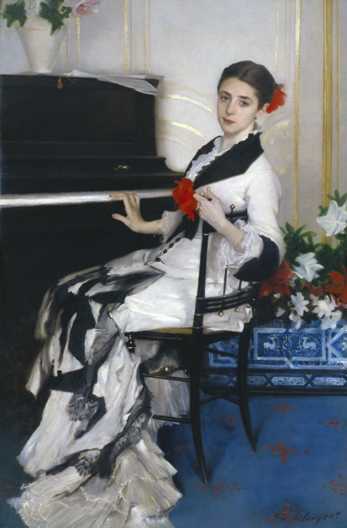 And that brought me to my own starting point with Sargent: he was the chosen painter of what I call “rich guys’ wives,” a kind of celebrity himself by painting the portraits of celebrities. I’m reminded always of photographers like Richard Avedon, whose work attracted attention as much for being about movie and rock stars as for being technically excellent, which it was. In this exhibition, however – the one focused on Sargent’s early paintings in and around the sea – we don’t see any of that. Mostly, I think, this was because he hadn’t charmed his way into the right circles yet. But it was also, artistically, an early phase he was going through. A couple of the pieces are even from his childhood, which is always impressive to see. Sargent and the Sea brings together the artist’s early beach scenes and will be the first to examine, in great depth, the little explored marine paintings and drawings produced during the first five years of his career. Works in the exhibition were produced during, and inspired by, Sargent’s summer journeys from his home in Paris to Brittany, Normandy, and Capri, as well as two transatlantic voyages. The show focuses on his personal passion for the sea and his knowledge of seafaring, expressed as a young artist in his late teens and early 20s, during the years 1874–1880. Recent discoveries of three important seascapes, and the location of other pictures previously untraced, including Atlantic Sunset, The Derelict and Seascape, have cast a new spotlight on Sargent’s activity as a maritime painter. It is no coincidence that he came from a New England family steeped in trade and shipping—his passion for the sea and his knowledge of seafaring are evident in this important group of early paintings, watercolors, and drawings. Looking at these pictures, works by Turner, Whistler and even Winslow Homer spring to mind. Two paintings central to Sargent’s early career serve as a centerpiece of the MFAH exhibition: En Route pour la pêche (Setting Out to Fish) and Fishing for Oysters at Cancale, exhibited, respectively, at the prestigious Paris Salon of 1878, and the Society of American Artists in New York that same year, when the artist was just 22. 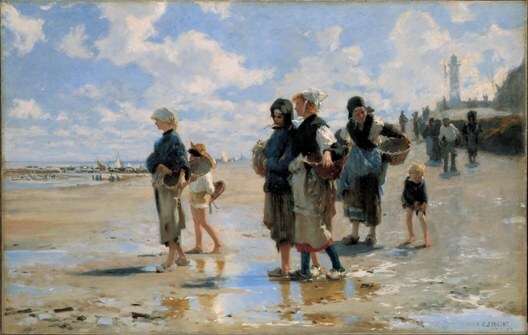 Although there are differences between the paintings, both depict a sun-filled scene of women and children getting ready to gather the fruits of the sea left behind at low tide in the Breton village of Cancale. There is a quality of immediacy and freshness in the scene, Neff explained to me, and yet both paintings are the results of systematic and carefully calibrated artistic endeavor. Indeed, Sargent left behind no fewer than 12 preparatory and related works, which have been brought together for this exhibition. Outside of New York and Boston, Houston happens to have the largest holding of Sargent paintings in private hands in the United States. The companion exhibit Houston’s Sargents showcases some 30 paintings from the private collections of Houstonians, including some of Sargent’s finest work. From paintings of a Spanish courtyard and a view of Venice to the famous society portraits on which he built his career, Houston’s Sargents presents a broad spectrum of the artist’s work to complement the exhibition Sargent and the Sea. Prendergast in Italy, also currently on view at MFAH, is the first exhibition devoted entirely to the Italian watercolors, monotypes, and oil paintings by the American artist, featuring more than 60 views of Venice, Rome, Siena, and Capri. Prendergast in Italy also includes the artist’s personal sketchbooks, letters, photographs, and guidebooks from his two trips to Italy, in 1898 and 1911. Prendergast was born in St. John’s Newfoundland and moved to Boston at age 10, where he was working as a commercial artist by 1886. He developed his mature style, however, during early trips abroad to France (1891-1895) and Italy (1898-99). Renowned for his paintings full of joie de vivre, the view of Italy that Prendergast presents was informed by French Impression and other European trends, but filtered through the eyes of an American artist and tourist encountering Venice for the first time. This exhibition demonstrates the advances of abstract color and form that put Prendergast on the cutting edge of American modernism. Since the majority of the works in Prendergast in Italy are of Venice, the armchair traveler comes away from this exhibition with a vivid sense of that unique city, its canals, and famous monuments as seen through the eyes of an American on the forefront of 20th-century modernism. Five paintings are displayed so that both sides of the works are visible. These double-sided watercolors, in addition to many sketches, unfinished works, and archival materials, provide a special glimpse into the artist’s creative process. A large group of color monotypes showcases Prendergast’s daring approach and experimentation with the medium. 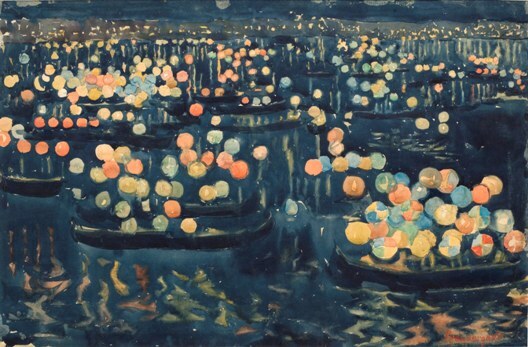 And finally, there’s my personal favorite in the show, a nighttime view of the Feast of the Redeemer on Venice’s Grand Canal, an Impressionistic-on-the-verge-of-Abstract vision of colorful lanterns slicing open the darkness. Watercolor and pencil? No. Monotype? No, not that either. Uniquely in all of Prendergast’s long lifetime of work, the picture is a tile mosaic. In a magical, not-very-Italian city graced with so many mosaics from its ancient Byzantine past, Prendergast discovered his most modern medium of all. Somebody really should determine, once and for all, how many people buying tickets to this show think it’s the newest spectacle from Cirque du Soleil. No, I’m not making a trademark claim, since any such issues would have been settled among high-priced lawyers millions and millions of audience members ago. 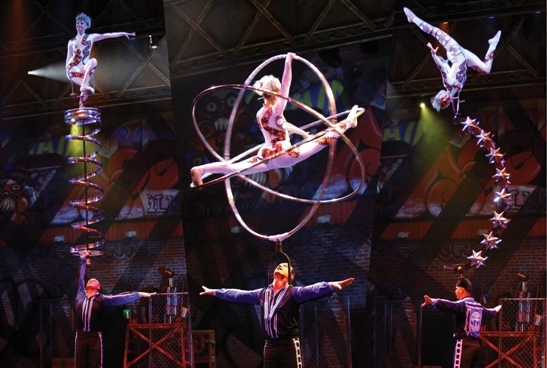 And besides, the word “Cirque” refers technically to the grand circus traditions of Europe and Asia, from which both brands of shows draw so unabashedly, so lovingly and proudly. It’s simply interesting to ponder the tag-along effect of waving a flag routinely confused with one of the most beloved brands in modern entertainment. And that confusion is certainly no accident. Within that fact lurks Cirque Dreams’ single greatest question. Why does its creator, Neil Goldberg (a veteran of Super Bowls, the NBA, Disney, Busch Gardens, Six Flags and Branson, and it shows)… why does he serve up extraordinary feats of individual balance and strength, and then distract all eyes from them with a ridiculous array of other characters, movements and sounds? Goldberg at times seems to defy us to focus on what matters, and not in a pleasant way, as though he figures the audience is made up entirely of children with the latest attention disorder. Again and again, a super-dramatic act high above the stage is surrounded by people walking, strolling and dancing, plus a never-ending series of whimsical cutouts that seem to scurry meaninglessly between the wings. Because they can. This show’s most telling act of product differentiation is ceding to Soleil the land of magic, mystery and illusion – and this, oddly, despite the emphasis on “Dreams” in its name. In the Soleil sense, there are no dreams on this stage – no characters who seem human, animal or some combination of both, singing odd folk songs in a language that combines words from many, no ragtag band of gypsy musicians pumping, banging and tooting on instruments borrowed from Dr. Seuss, and no circus acts lifted so far above their ancient European skill sets it becomes a sport to identify them within each dazzling moment of fantasy. Cirque Dreams is not a dream but a show, an extremely American musical-theater show, full of singing and dancing, and fairly typical versions of each. At worst, it’s a Broadway revue you never heard of, set in some colorful American inner city and put on by better-than-average street performers working for tips. And work they do. Once you stop longing for magic and illusion, and especially once you stop waiting for the capably bluesy African-American singer playing a TV news reporter to sing a song that’s actually any good, you sit back and enjoy. Highlights include the wonderful wire walker who kicks things off (stepping, sliding and even flipping his body along a wire that’s not a tight rope at all), the Asian miracle workers who spin in and around hanging cubes, the juggler who creates Stomp-like percussion banging dozens of whirring balls off a weird drum-keyboard, and the perch balancer and his gravity-defying aerialist. Martin Lamberti is one of the few performers who make us look up their names, for his hilarious miming as a movie director making a silent film with our own audience members as stars. Except that of course, this being Cirque Dreams – the show that isn’t Cirque du Soleil – you leave guessing that those folks weren’t really members of the audience either. Hobby Center through Feb. 21. Anyone who missed the turntable in TUTS’ most recent production of Les Miserables will delight at the triumphant scene-stealing helicopter in the company’s re-mounting of Miss Saigon, a show that, once it settles into itself deep into the second act, proves to be a stunning fait accompli for the hometown musical producer. The late-eighties rock-opera retelling of Puccini’s Madame Butterfly by the creative team behind Les Miserables has always been a piece long on melodrama and short on realism, and TUTS’ cast manages to deliver mightily on the former and even somewhat well on the latter–no small feat, given that the characters in Miss Saigon can easily veer into stereotype. Amid the chaos of Saigon in 1975, with Americans rapidly pulling out of the city in advance of the North Vietnamese storming the gates, American GI Chris falls in love with 17-year-old bar girl Kim. Their heated affair sets in motion an unstoppable force, sweeping across Vietnam, Bangkok, Atlanta and destiny. Holding the show together is the dynamic Melinda Chua, whose tenacious portrayal of Kim is both vivid and steeped in pathos. She veers from trepidation to joy to despair to hope across these two-and-a-half hours, dragging us along for the ride. She is lovely in singing the duet “Sun and Moon” with her beloved, and simply fierce in her confrontation with her cousin on “You Will Not Touch Him.” Eric Kunze’s Chris has a great disaffected look, and a strong, gorgeous voice, but he spends a great deal of the show spewing angst in a manner that indicates either over-acting or over-directing. The Fagin-esque Engineer, played by Joseph Anthony Foronda, is mostly delightful. He spends the first half of the show snarling out his lines and songs, with little of the wry, ironic look at his lot that made the role’s originator, Jonathan Pryce, such a delight. It’s a shame to sit through his snarkiness for three-quarters of the show, before he opens up and just owns every inch of the stage in his act two showstopper, “The American Dream,” delivered with the sheer joy of a much-loved fantasy, mixed with his own sardonic take life. Directed as though the cast were on a treadmill, and told to grab everyone in the Hobby Center by the hand and whisk them along, director Bruce Lumpkin does the show a disservice. I am sure the intent was to convey the insanity of war and the grasping at any small thing to make the horror less real. 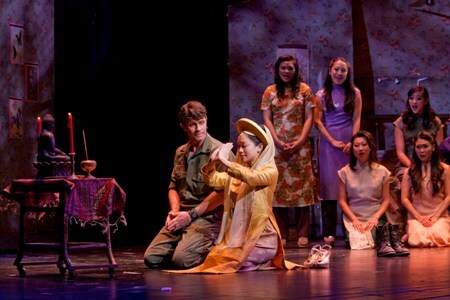 But Miss Saigon has stunning moments of introspection, and great, deep pondering themes. This production is so busy sweeping everyone up in the rush and crush of war, it’s difficult to see them. And as for the above-mentioned scene-stealing helicopter, it plays a pivotal role in an Act Two flashback at the U.S. Embassy that emphasizes the madness of the Vietnam War. In a scene like that, Lumpkin’s rapid-fire directing and the cast’s full-panic delivery is spot-on. 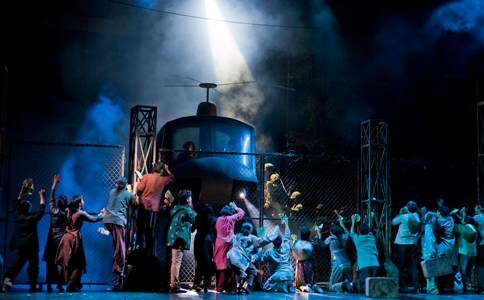 Photo: (above) The famous Helicopter scene, and (below) the wedding of Chris and Kim, in TUTS’ production of Miss Saigon. The weather turning cold and rainy (or snowy in places depressingly nearby) accomplished two things. It made me pull out the brand-new heavy coat I bought for visiting Finland in less than a month. You know things are bad when Texans are wearing clothes intended for Finland. I resisted wearing the scarf I picked up on clearance, or the gloves, or that silly new hat with the earflaps. 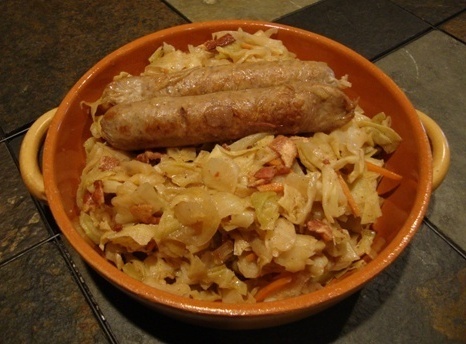 The second thing cold weather accomplished was making me think of French-German choucroute garnie and, by sensory association, of the so-called sweet and sour cabbage my late father always made as one of his signature dishes. It didn’t seem to be an “old family recipe” – just something he’d picked up from a cookbook, perhaps during those nights he and my mother read recipes to each other across the kitchen table while swigging cans of Dixie beer. This was New Orleans, after all. The choucroute garnie I enjoyed in Paris during my first visit that cold, rainy winter of 1974 was, like most things in this world, a lot blander than the stuff my Dad or anyone else I knew made. Then again, he spent his whole adult life in Louisiana running from the foods he’d had as a child in Boston – except for lobsters, clams and “New England boiled dinners,” the latter of which he inexplicably loved, no matter how much they stank up the house. I was at a restaurant called Julien, which The New York Times had recently spotlighted as the best cheap meal in Paris. A real working man’s dive, I read. And since I, then as now, imagined myself a real working man, I had to go there. Plus, I could afford the (I think I remember) $5-7 The Times assured me you could feast on. Sadly, the owners had taken their sudden international fame to heart. They’d quickly remodeled, quickly dressed the waiters in tuxes, and more quickly still, raised their prices. This was 1974, deliciously pre-euro. But I still think the entrées had risen toward $20 worth of French francs – and hell, my Left Bank cold-water walkup on the 5th floor with a WC down the hall was only $7, including breakfast and either lunch or dinner. The cheapest thing on Julien’s menu was the choucroute garnie (it’s mostly cabbage, so it could be), so I ordered it by default. It didn’t have a ton of flavor: the sausage sharing the tureen was gray-white, and the stewed or smothered cabbage was pale as it could be. If color equals flavor, as I usually preach, the dish tasted exactly the way it looked. But it was an icy-rainy night in Paris in February, and I had come into Julien half-soaked and shivering; the food was hot and wholesome and, well, like home. I was 22 years old and alone in a country where I knew no one. I needed a plate full of home. No color? Not on my watch! Caramelization (and carrots) to the rescue. No flavor? Hell, we in Texas have bacon and seasonings for that! I’m sure, tasting my creation now with a toast to my Dad (not Dixie, Australian shiraz), that all these world problems could have been remedied much earlier had France and Germany shared a border with the Gulf South. In a large pot with a lid, brown the bacon and the bratwurst, rendering the flavorful fat, in the olive oil. Remove the bratwurst and the bacon slices to drain on a paper towel. Crumble the bacon. Over medium-high heat, deglaze the pot by pouring in about half the wine and scraping up the browned bits from the bottom. Just before the wine has evaporated, stir in the onion and carrots, cooking until the onion turns golden. Then add the cabbage and stir together. As soon as cabbage has started to cook, pour in the vinegars (using only either one is okay, but they are better together), along with the remaining wine and the sugar. Stir in the crumbled bacon. Bring to a boil. Season with all the remaining ingredients. Cover the pot, lower the heat and simmer until cabbage is tender, about 20 minutes. Add more sugar if desired. Serve 1 link of bratwurst – reheated in the cabbage when ready – on each plate with a mound of the cabbage. Also, a mixture of jasmine and wild rices can be excellent with this spooned over the top. Serves 4. Note: For a different but equally wonderful flavor, substitute Shiner Bock for that Riesling. The German-Czech-rooted town of Shiner, Texas, produces some of the best bratwurst I’ve ever tasted, so using beer might be the proper recognition. In the realm of visual arts, works described as “mixed media” or “multi-media” hang in virtually every museum and gallery on earth. Thus you have sculptures that are painted on, as well as paintings that sprout bits of sculpture – and these days, you certainly have either (or both) built around video monitors or featuring a flat surface for projections. Still, while certain collaborations have been a part of the performing arts forever, “multi-media” partnerships like the current Romeo & Juliet by Dominic Walsh Dance Theater and Mercury Baroque are few and far between. For one thing, such pieces don’t exactly exist. In order for the performance now at the Wortham through the weekend to become a reality, Walsh had to scrap just about everything ballet had in storage or memory for the tragic romance, including the familiar (terrific) Prokofiev score. And Mercury Baroque artistic director Antoine Plante had to gather what sounded like a hundred snippets from Vivaldi (including a few bits for solo and choral voices) and weave them into the stuff that star-crossed dreams are made on. The result, a shape-shifting fusion of Shakespearean acting, Baroque singing and of course passionate, muscular Walshian dancing, filled the stage opening night in a way that also filled the hearts of anyone fortunate enough to be in the audience. Mercury Baroque’s conductor and his 16 musicians are probably the unsung (though in another sense, most obvious) heroes of the evening. After coming up with the music in the first place, Plante and Co. keep a lively but responsive beat throughout the evening, ever ready to follow the baton, which in turn can follow the dancers, singers, actors and anything else onstage. This seems especially crucial in times when the worlds collide: say, when dancing gives way to aria, whether sung by baritone Gabriel Preisser as Lord Capulet, Juliet’s father, or even better, by Mercury Baroque regular Ana Trevino-Godrey as the young lady’s Nurse. Things really get complicated when there’s dancing, singing and acting going on, including the intricate, even delicate harmonies of Vivaldi performed by the Bach Choir of Houston. Throw in some sword fights expertly crafted by Brian Byrnes and somebody had better play traffic cop here. Plante apparently looks pretty good in a badge. The second big hero of this Romeo & Juliet must be the simple but eye-catching set designed by Jorge Ballina with lighting by Robert Eubanks, which relies almost entirely on a large suspended wooden square with hanging drapes of varying densities. This square can be lowered to the ground to all but disappear, be raised on a horizontal plane so the drapes create a house or room, or be tilted forward (most impressively, to let Juliet climb down from her famous balcony and dance a pas de deux with Romeo) or backward (as when it suggests a window that’s more of a gaping mouth through which the banished Romeo sneaks to spend his wedding night). The latter scene is replete with cruel “jaws of fate” imagery, especially since almost everyone on earth knows what’s to come. Walsh takes many liberties with the story, but none that undermines its heartbreak – and, sidestepping one of his demonstrated weaknesses, none that seeks to shock merely for shock’s sake. There is certainly some modernity on this stage, including a few emotional and visual links to Baz Luhrmann’s film, in which the feuding Verona families emerge as urban street gangs. But the most substantive change here is having Lady Capulet (powerfully danced by Rachel Meyer) be sexually involved with her presumably younger nephew Tybalt. In plot terms, Shakespeare would have known this only gets in the way – but in dance terms, it gives the usually lost-in-the-wallpaper mother a change for strong, seductive dancing with DWDT stalwart Domenico Luciano. This kind of couples work (think man and woman climbing up and down each other’s bodies like parallel elevators) is one of Walsh’s greatest strengths, as we saw recently in his rethinking of The Firebird. We generally don’t want that much rethinking of Romeo & Juliet – and gratefully, in this wonderful new/old production, we don’t get it. Some excellent acting is delivered by Adam Van Wagoner as Paris, the Capulet’s chosen husband for their daughter, and particularly by Jim Johnson as Friar Lawrence, a role he played the last time Walsh tried his hand at this story. Still, the DWDT dancers prove themselves no slouches in the acting department, trading Shakespearean lines with the non-dancing actors in between their dynamic solos. Randolph Ward serves up a wonderful, fun-until-he’s-dead Mercutio, while Ty Parmenter and Felicia McBride are utterly believable as the young lovers. Their many duets, most touchingly their early scenes inspired by the Bard’s best-ever pickup line “Let lips do what hands do,” are nothing short of contemporary ballet perfection. Combining the parlor manners of a Jane Austin novel with the whiplash wit of Noel Coward, Jeffrey Hatcher’s Mrs. Mannerly is the story of a manners and etiquette class in 1967 Steubenville, Ohio. It is by turns raucous, bittersweet and an utterly real coming-of-age tale. In a time when people routinely show their age by asking where manners have gone, Mrs. Mannerly might be something of a throwback to a nostalgic time that never was, but it’s still a refreshing comedy that turns a keen eye on human behavior. The play tells the story of Mrs. Mannerly, who’s set up shop teaching the well-heeled and well-heeled wannabes for the past 36 years. Into her room at the local YMCA, she covers the windows with beautiful landscapes and the basketball floor with a rug. Hers is a world where all things can be cured if we only place the shrimp fork in the correct spot in the place setting. Enter into this Jeffrey, Hatcher’s fictionalized version of his young self (who really did take an etiquette class growing up in Steubenville). He admits he’s not much good at the things boys in the 1960s are supposed to be good at: sports, girls, getting into trouble. But he looks at his manners class as a place where he can excel, and he’s determined to be the first of Mrs. Mannerly’s students to score a perfect 100 on the final manners exam, held at an annual dinner for the Daughters of the American Revolution. Along the way in this likeable romp, Jeffrey learns manners and Mrs. Mannerly grows away from her stern spinster stereotype. 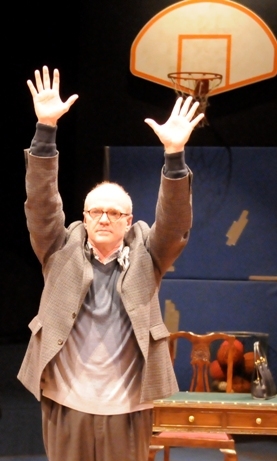 James Black has a ball playing Jeffrey and the other four students in Mrs. Mannerly’s class, veering from character to character with hand gestures and voice changes. He steps from in the center of the action to narrating it without ever missing a beat and is a sheer joy to watch. Josie de Guzman plays Mrs. Mannerly with buttoned-up bravado, her elegance and poise a careful veneer for a woman with some kind of past. 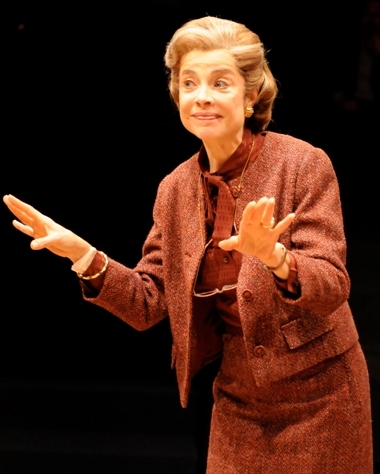 If she sometimes strays into caricature of a certain kind of mannered woman, it’s equally likely that Mrs. Mannerly is exactly that kind of character. The production is directed with great precision and timing by John Rando, who also directed the Alley’s much-enjoyed The Man Who Came to Dinner last season. If manners are more about making another person feel comfortable than they are about the precise use of the phrase “Good day,” be sure you RSVP for this one – it’s a standout in one of the Alley’s best seasons yet. Photos by Jann Whaley: (above) James Black, (below) Josie de Guzman in the Alley’s Mrs. Mannerly.